CPU: 8051/89C51 CPU operating @10/12MHz. Based on Intel's 8086/8088 CPU operating at 2.5/5MHz. 32K bytes of EPROM loaded with powerful monitor program(2764/27128). 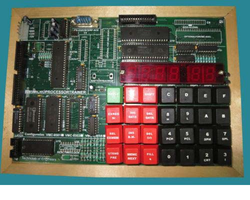 Total on board memory capacity of 256K bytes of RAM and 256 K bytes of EPROM. Based on 8031/8051/8751 operating at 10/12 MHz. Battery backup for RAM area. 8/16K bytes of EPROM with powerful monitor program. Laparoscopic Training Kit C You can improve your laparoscopic movement and suture skill with this laparoscopic training kit by suturing the skinpad. The skinpad is realistic and has high durability. 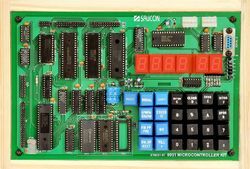 32k bytes of RAM and 32kbytes of EPROM. seven segment display and hexadecimal key board. Backed by the team of experts and skilled professionals, we are engaged in offering a wide range of Microcontroller Development Kit to meet the demands of our customers. These products are well designed and are easy to carry. The use of latest machines and advanced technologies are being done while manufacturing these products. Learn to make Programs in Assembly Language and C Language with KEIL C COMPILER Develop your OWN systems based on 89V51 Microcontrollers. The 8051 microcontroller trainer kit (model MD51) is designed to provide a hardware platform to teach and learn the 8051 microcontroller in a quick and easy way. We at EmbedVISION provides Industry level training on various microcontrollers. We ususlly focus on software as well as hardware description of each and every phase of building an automated circuit using microcontroller. We offer microprocessor lab kits which are of high quality and used in many industries.